I went back to a Paul Hollywood recipe for this week’s Cooking School. I’ve mentioned before how much I admire him and love his recipes, so often I’ll turn to his book, 100 Great Breads, when I’m looking for inspiration. This week I chose to make a favorite flatbread of mine: naan. Naan is a traditional Central and south-East Asian bread that is baked in a special oven, called a tandoor. It is typically made with flour, water, yeast and yogurt, which gives it its traditionally soft texture. It is a bit similar to pita bread, if you have never had naan and are looking for something to compare it to. Paul Hollywood’s recipe is different from most because he calls for pan frying the bread instead of baking it. He also doesn’t specify the exact amount of water needed for the recipe, so I made sure to measure as I went along to help any of you (readers) along. Paul includes cumin and carraway for seasoning, which contribute a hint of flavor that makes this bread perfect for pairing with savory dishes. Normally, I would recommend some sort of curry or saucy dish to dip the bread in, but it also functions as an excellent dipper for soups. This naan is fluffy on the inside wiith a nice chew to the outside. hough it was not quite as light as some oven-baked naan I’ve had, it was stillÂ excellent. The fact that it was incredibly easy is just an added bonus. In a large bowl, stir together flour, yeast, salt, cumin and carraway seeds. Add water and stir until a soft dough forms, pulling away from the sides of the bowl. Add an additional tablespoon or two of water, if necessary. Working within the bowl, knead dough until smooth and elastic. Divide dough into three balls and place on a large sheet of parchment paper. Let stand, uncovered, for 1 hour (add 15 minutes if room is chilly). Roll dough out into 10-inch rounds. Let rest for about 5 minutes. Spray or brush the bottom of a large skillet thoroughly with olive oil and heat over medium-high heat. Cook each naan until browned, about 5 minutes, before turning to brown the other side. Serve warm. I’ll go Deli on 18th Febuary for holiday. So I am glad to see this indian bread. Wow, Nic…that looks delicious! I have to learn how to make good Naan. Did you use a cast iron skillet? Do you think a plain metal skillet would work? hmmm, that bread book looks like it just might be up my dense and inedible bread strewn alley. Oh! I have to try this! Thank you! I’ve never ha dthis bread before. 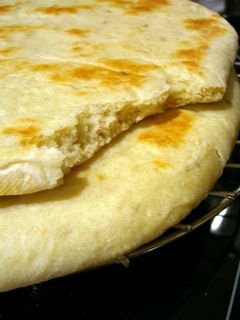 I’ve been wanting to make naan for the longest time, but I haven’t been able to settle on a recipe. Now I think I will try this one. It seems kind of like a thick tortilla. 5 tsp yeast for 4 cup flour? That’s a lot of yeast, isn’t it? I’ve never made my own naan, but I completely adore it. I will definitely have to give this a try~! I was just wondering since you make all these delicious breads if you do recommend a bread machine and if so what kind? I’m just starting out as more of a college age cooking blogger so any help would be appreciated. Thanks. I wanted to make some naan when we had indian food about a month ago, but every recipe was too time consuming. Im going to try these. I wonder if I could use some whole wheat flour? Topher – I actually have never used a bread machine, so I can’t recommend a specific brand. I have heard good things about using them to mix the doughs, then baking them in an oven however. Amazon.com and Cooking.com have a lot of reviews on their sites, so I would look there. Randi – You can always try! It uses yogurt & baking powder instead of yeast, so its chewy instead of bready — a little more work (each bread goes from stovetop to broiler), but still fairly quick & easy & AMAZING. We bake our Naan under the grill and this takes 2-4 minutes depending on thickness. We also use yoghurt and yeast or sourdough yeast. Quick to cook so it’s very practical. The naan in the picture is much too dense. Remember naan is traditionally cooked in a clay oven so try to replicate that at home. The best method I learned is use yogurt in the dough. Also use a pizza stone, heat the oven up to 500f and then put it on high broil. It’d only take 3-4 minutes per naan and they’d turn out as close as you can get to a clay oven.